Description: Sexes similar. Sparrow-like. Blackish-brown above, with pale edges on rounded back feathers giving scaly look; whitish underparts with a buffy wash; short dark streaks on breast; prominent dark eye in pale buff face; streaked rump; pinkish legs; and white outer tail feathers. Behavior: Secretive and somewhat solitary. 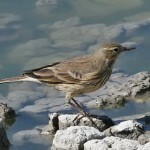 Unlike American Pipit, does not have habit of pumping tail. Habitat: Found in dense, grassy vegetation of plains and prairies. 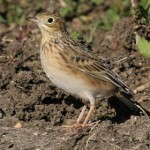 Unlike American Pipit, not often found in bare areas close to water. 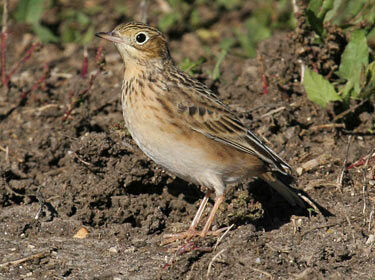 Where in Nebraska: Uncommon spring and fall migrant, probably occuring statewide. Most observations from central Nebraska (especially Webster and Adams Counties). Fun Facts: When Sprague Pipit males are displaying for females they will sometimes hover in the air for half an hour to attract a mate. One male was once recorded remaining airborne for three hours displaying for a female before descending to the ground.